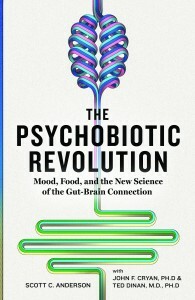 Can your gut microbes affect your mood? That preposterous theory has now been well demonstrated in animals, and more recently, humans. The microbes that chase the blues are called “psychobiotics”. Through various avenues, your microbiota can communicate with your brain. If your microbiota gets out of balance, you can quickly become anxious. If you’ve ever suffered food poisoning, you know the feeling. This is called dysbiosis, and if you can’t shake it, you can end up with chronic inflammation and long-term depression. Fascinating topic! Do you plan to put this book in audio to make it more accessible? I love this topic and am a promoter of supporting leadership through the food we eat. My company would be interested in introducing your book to the chinese market, where we are established since a decade. The good folks at National Geographic would be happy to help you with that! I loved the book. Can anyone recommend good sources of GOS or a good supplement? Seems easier to eat FOSs. Thank you, I Love this deep dive into a spectacular topic. However, I tumbled on page 103 where a western diet namely a high-fat diet is mentioned to be a potential cause for today’s increasing inflammatory conditions. In functional medicine I learned that it is not the fats but supposedly the loads of bad fats and carbs that are inflammatory. Actually functional practitioners recommend to forget about the fat lie and nurture the body with healthy fats. With this background, your paragraph is very confusing. Great if you could clarify! Hi Mary. The amounts of fats they use in these studies are quite high. It’s hard to say exactly which foods will be inflammatory for any person because of the variation in microbes. But any food that causes microbes to fall out of balance or to bloom in the wrong place (like the small intestines) can lead to “leaky gut”, and that’s when the problems occur. Carbs are the problem for some people, excess fats for others. And if you have an active flareup, you should take a break from fiber until you can calm things down. That’s what the FODMAP diet does. It’s not a fun diet, but it’s only meant to be a short-term fix — once the gut is healed, you should try to get some good fiber to balance those simple carbs.